You would be forgiven for thinking a film with fairly a corny title like Let’s be Cops would be on par with something like Ride Along which came out early this year. As good as some comedies have been this year, we have had our misses but the end product on show here from Director and writer Luke Greenfield far exceeded the fairly low expectations I went into the cinema with. I always walk out of screenings like this with a spring in my step and feeling like I somewhat cheated death. Let it be noted though, the key words in everything above though are “fairly low expectations”. There is this lingering feeling of missed potential underlying the characters and the story. 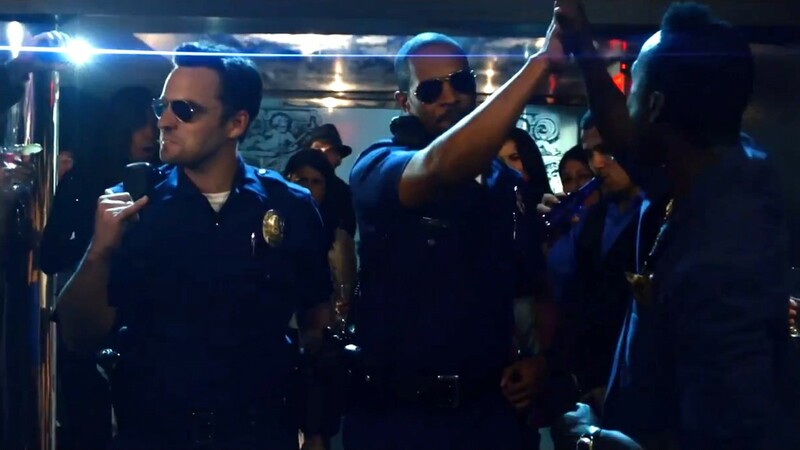 Let’s Be Cops stars Jake Johnson and Damon Wayans Jr. as Ryan and Justin, a couple of guys who appear stalled in life. Ryan is a former college football star and maybe an actor who’s only significant credit is a genital herpes commercial. Justin is an aspiring videogame developer but his boss and his timid persona hold him back. Early on, we see him pitch his reasonable video game idea about cops in L.A. to his irritating boss who doesn’t like it and asks for super powers and zombies and turns it into this preposterous idea called Fire-fighters vs. Zombies.Justin has a pair of police uniforms which maybe were to play a part in his presentation and after the disappointment of the day Ryan awed by the uniforms convinces his reluctant partner to wear the uniforms to a college/costume party which rather embarrassingly turns out to be a masquerade ball instead. The reunion is a harsh reminder of how little they have done in life and they leave the ball down and dejected until walking down the street they realise people are acting different towards them. They are being noticed and even admired and they realize what it is; the uniforms. They decide; let’s be cops – a little longer at least. This premise feels lame and borderline unbelievable but the film does a decent enough job of selling this especially through Ryan. Nothing has gone for him probably since his football prospects were ended through injury. Watching him agonisingly try to explain to his old mates what it is he actually does cut deep and pricked at some fear peeps like me straight out of school might have. It is for this reason I kind of buy into his obsession with being a fake cop and it does get disturbing. He gets some cop gear, learns all police protocol and codes on YouTube and even buys a police car. You could argue for a moment he was more committed than regular cops. Justin tries pulling Ryan out of this fantasy but even he has some affinity for this new life and it is through the cop uniforms he gains some confidence and gets an in with his crush Josie (Nina Dobrev). Their new personas are an out from the travails of their real life, almost like a video game but tied in with its comic reality. The film doesn’t completely do away with consequences as most comedies are tempted to. The edgy Justin researches the consequences of impersonating and office and they are aware it is illegal and the time they face if caught. They are also drawn into an actual case involving Josie who works in her parent’s restaurant and a menacing tattoo covered gang leader and they sense they are definitely way over their heads. The early gags are telegraphed and tediously zany but the films humour develops to become a little more organic although still maintaining some wackiness. I laughed way too much completely disregard this film which is in essence a comedy and meant to offer laughs. Our two stars and eager and have genuine comic guile so do the some of the supporting cast who deliver when called upon (Rob Riggle, Keegan-Michael Key and Joshua Ormond) and you know there is a really good film hidden in there somewhere. The plot runs rough for most of the 90 plus minutes and I had to labour through some scenes almost dozing off at a point I will admit but the ever-present humour gives it some mouth to mouth. The director knows to up the ante late on to give some bite to the proceedings but you can’t help feeling a more tactful director could have crafted some edgy dark humour I for one would have preferred to the workable wackiness. Our leading men work well together and acquitted themselves in what we could call their breakout film roles. The film may lumber through with numerous holes but it is still a funny and enjoyable romp anchored by likeable characters.